All iron powder cores are special orders. Please allow one week for shipment after order received. 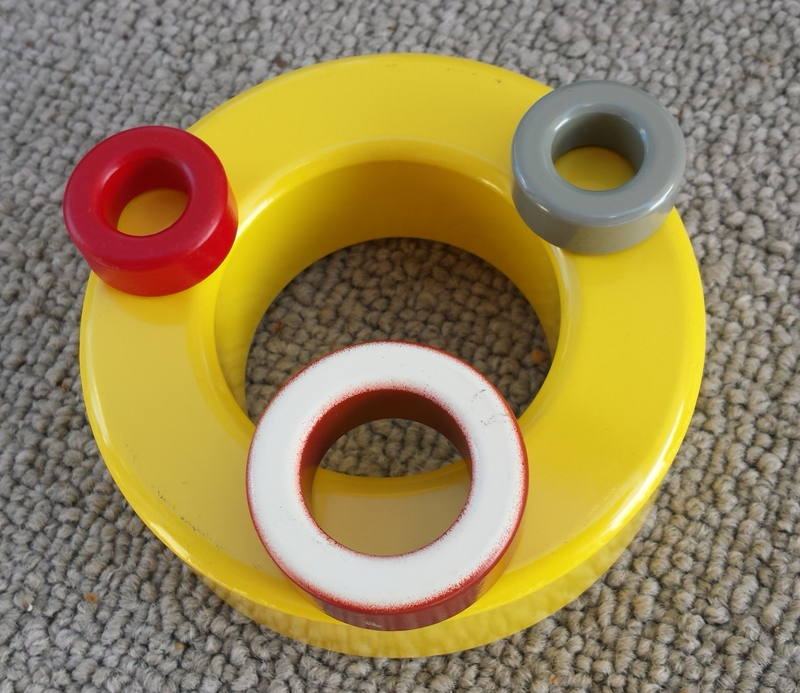 The iron powder cores shown are primarily used for either high power feed line chokes for common mode current reduction or for 4:1 and 9;1 very high power transmission line transformers. 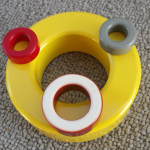 For high power feed line chokes, choose the inside diameter of the iron powder core closest to the transmission line outside diameter and use 6-20 cores at the junction with the antenna feed. Use Mix 2 for all the above transmission line transformers. Fully assembled and enclosed units are available for each of the power levels. Click HERE for information. For .1 – 2 MHz wide band transformers use Mix 26 which has a higher permeability and requires less turns to achieve a given inductance. Mix 2 has almost constant permeability from 1-30 MHz. Mix 26 has an initial permeability of 75 at .1 MHz and gradually decreases to about 10 at 30 MHz. For high power AM broadcast range (.5-1.7 MHz) transformer, use Mix 26 to reduce the turn count. To order specify core size and mix (e.g. T200A-2). Available in sizes that have µH per 100 turns shown in table. The iron powder cores shown in the above tables are primarily used for either high power feed line chokes for common mode current reduction or for 4:1 and 9;1 very high power transmission line transformers. Shipping on larger cores in quantity may be more than $10 – email/call for quote.